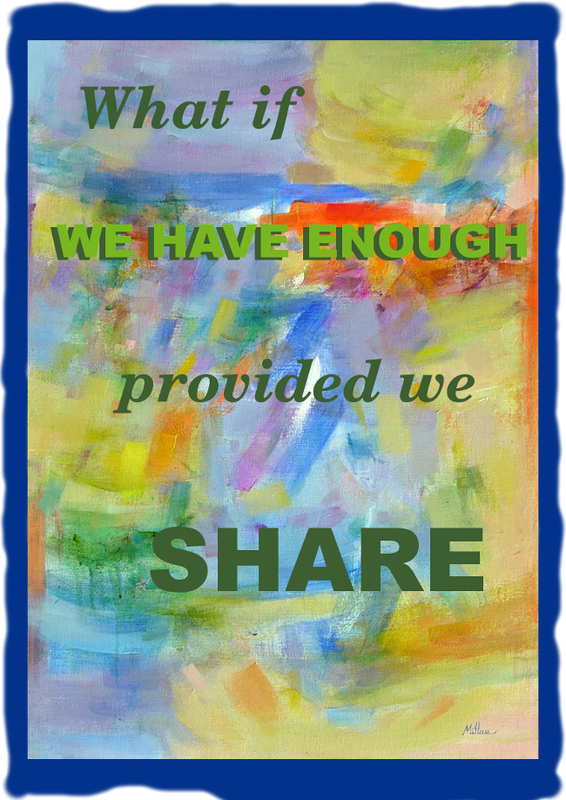 What if we have enough…provided we share. What if we decided we would all be better off if, rather than playing a competitive game of hoarding, we did what we could to distribute what we collectively have such that everyone has enough to thrive? The world is having problems because of over population. However, it has been found that whenever women are educated and treated equitably, their fertility rate goes down, and the survival rate of those children born rises due to improved health. Whenever a population is stressed, a certain amount of isolationism occurs. A certain “everyone for themselves” mentality kicks in. If we start questioning who we can trust, suddenly immediate family becomes important. Surely we can trust our families? The same is true if out of fear we want supporters to protect us: immediate family become our team, our cushion, and our army. Family codependency seems like a solution. We evolved as social creatures who require one another for survival. If we no longer see our community as a source of support, then we are going to want all the directly related babies to raise that we can produce. If we share, the stress becomes alleviated. Populations have the opportunity to stabilise and shrink to manageable levels. We reconnect with our communities. We find that we have even more to share. Our collective wealth increases as does our collective well being. To gain these benefits we have to be willing to let go of wanting all the power and all the stuff. When you are stuck in a fearful rut it seems counter-intuitive that sharing those things will save you. However, if on a sinking cruise liner you threw everyone but yourself overboard, you would not have the human capacity to stop the boat from going under. You need all those crew members who might be able to stop the sinking, or at least get people to lifeboats and direct those lifeboats to safety. When we improve everyone’s lives we suddenly have more human resources. We have more people who can conceive of solutions, build solutions, and make the solutions work. To think only a few have the answers to save us is a deeply broken way of seeing the world that comes from racism, classism, sexism, and any number of other “isms”. Whether we like it or not, we need each other. As I keep saying about the current state of our world: the answers are easy. The problem is getting people to look up and cooperate.